What connects the Duchess of Malfi and Black Panther, the comic-book superhero? More than you might have thought, according to actor Joan Iyiola. Despite an intense morning of rehearsals for John Webster’s The Duchess of Malfi, in which she is playing the lead role for the Royal Shakespeare Company, when we meet she speaks fluently about gender, race and Marvel’s new blockbuster film. “It’s so amazing because Black Panther is giving young black boys and girls a vision of superheroes that we never had,” she says, before making the link to matters at hand. Even after joining that eminent list of dames who have played the role on the RSC stage – from Peggy Ashcroft to Judi Dench – and working with Chiwetel Ejiofor and Daniel Kaluuya as well as setting up a hugely successful support network for young actors called the Mono Box, she still finds herself being called ‘emerging’. “There was always this sort of sense that you were emerging, then at some point you were established, and there wasn’t really anything in the middle,” she sighs. 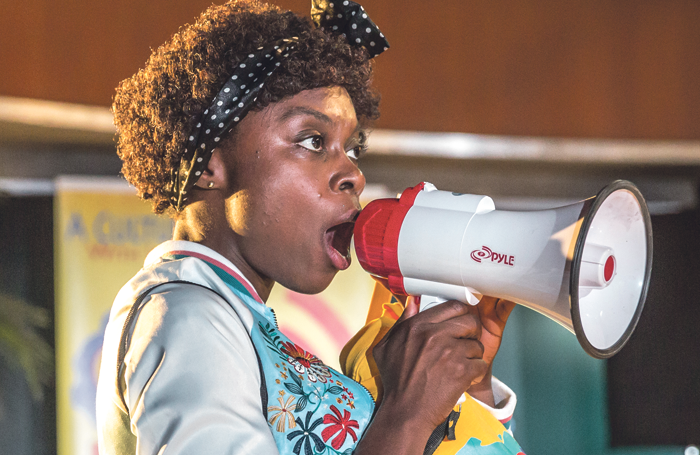 Six years after leaving drama school, Iyiola now has more control about the parts she plays. 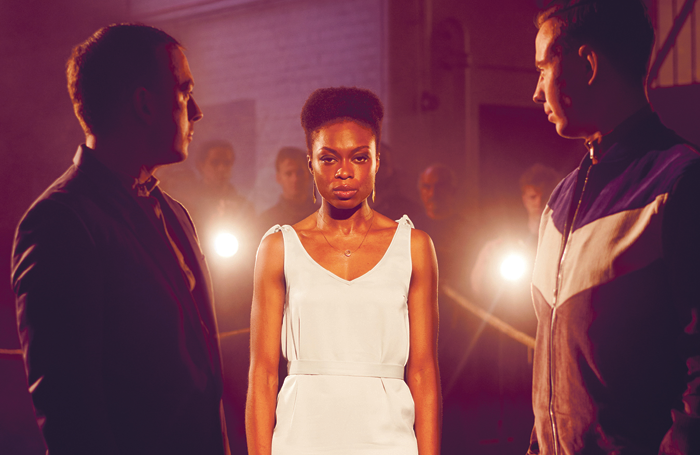 They are often powerful women, as in Danai Gurira’s Eclipsed at London’s Gate Theatre in 2015 and the daughter of the queen of the Iceni in Tristan Bernays’ production of Boudica at Shakespeare’s Globe last year. But even if she’s already emerged as an actor, it is fair to say she is part of an ‘emerging’ generation of theatre practitioners working relentlessly to change the industry for the better. Iyiola spent six summers at the National Youth Theatre, where she started to enjoy “this feeling, this way of expressing myself”. But her parents actively discouraged her from pursuing acting as a career and she ended up studying law at Cambridge University. As her degree progressed, however, law started to take a backseat until Iyiola decided to apply for drama school in the middle of her final exams at Cambridge. “I thought it would be a good idea,” she laughs. She didn’t get in. But after temping for a bit she applied again and got an offer from Bristol Old Vic Theatre School. What was your first non-theatre job? Teaching. What was your first professional theatre job? RSC 2012/13 winter season – A Life of Galileo, Boris Godunov, The Orphan of Zhao. What do you wish someone had told you when you were starting out? To find your inspiration and your tribe, look left and right, as opposed to looking up and trying to reach out for something that was part of a different story or generation. Who or what is your biggest influence? The Obamas, Viola Davis, Maya Angelou, Angela Davis, my mother: the Nigerian matriarch. What is your advice for auditions? As long as you’ve done your preparation, if in your own mind you are delivering the best interpretation you can come up with, that is your job done and you’ve given them a gift of something. You’ve given them a bit of yourself. That’s a really positive exchange. If you hadn’t been an actor what would you have done? I’m an activist at heart so something to do with being with people and effecting change in society. Do you have any theatrical superstitions or rituals? I’m very superstitious about what goes into my body. If I was tired I used to have a coffee. Now I try another way: meditation, more water. If I’m a little bit tired, maybe there might be something I can find in the performance. I’m also very superstitious about checking in with everyone before the show. And Iyiola certainly has been creating change since graduating. When she left the theatre school, where she was the only black woman in her year, she says she felt a little lost. “This acting thing still felt very mythical and mystical,” she says. So, along with a friend, movement director Polly Bennett, she set up the Mono Box, designed to be “a safe, friendly environment where as an artist you could continue to develop your craft”. Partly that’s through the group’s extensive play collection, with texts donated by practitioners of all kinds. Anyone donating has to write an inscription inside the cover explaining what the play means to them. The library now includes donations from Caryl Churchill, Dench and Michael Grandage. Perhaps most significantly, the Mono Box allows Iyiola and Bennett to hear conversations from young practitioners about how theatre should change for the future. And it allows them to link up with others in her generation properly pushing the industry forwards when it comes to gender – “probably the biggest thing of our generation” – race and class. We talk about Steven Kavuma, who set up the Diversity School to address the lack of black, Asian and minority ethnic representation, David Mumeni’s Open Door scheme to help people from low-income backgrounds enter drama school, Cherrelle Skeete’s Blacktress UK support network for black actresses and Elizabeth Berrington and Polly Kemp’s Equal Representation for Actresses movement. These are people not just clamouring for change, but making it happen, and Iyiola says it’s not a moment too soon. Even in a traditional institution such as the RSC, Iyiola has noticed a shift. It was where she landed her first professional role in 2012, for Michael Boyd’s last season, in Boris Godunov, The Orphan of Zhao and A Life of Galileo. It’s where she is returning for The Duchess of Malfi, directed by Maria Aberg. Although programmed more than a year ago, it is a prescient look at toxic masculinity. Playing the Duchess now, conscious of “all of the generations above who have paved the way for me”, Iyiola feels the weight of great responsibility that comes with the role.